On the evening of 26th June 1610, an affray broke out in 'a certain house called a playhouse' in Tonbridge. One Edward Calverley was beaten about the head and arms with staves, and received a dagger wound to the forehead from which he later died. The incident has been fully investigated by the Maidstone-based researcher Dr James Gibson using Assize Court records in the National Archives, local Parish Records and other sources. His published account can be read in full on the FreeLibrary website and he has kindly agreed to our including a summary of it here. In Dr Gibson's words, 'The reason for the fray ... remains a mystery, but the even greater mystery is why there was a playhouse in Tonbridge in the first place'. Two inquests were held in Tonbridge into the death of Edward Calverley. At the second of these the jury found that 'a certain Edward Oxley', who inflicted the mortal wound, had committed 'felony and homicide', with three other men – two butchers and a tailor – 'feloniously abetting, procuring, supporting, aiding and encouraging' him. All four were taken into custody to appear at Maidstone Assizes early the following year. There the jury found Oxley guilty of homicide and the other three not guilty. The 'neck-verse', so-called because a miscreant who was capable of reading it could claim 'benefit of clergy' and save himself from hanging. Edward Oxley did not hang for his crime. Instead he was granted 'benefit of clergy', a privilege allowing him to be retried in an ecclesiastical court, which did not award the death penalty. To qualify, Oxley had to demonstrate that he could read a verse from the Psalter in Latin, and submit to being branded with the letter M (for murderer) on his hand. This was necessary because benefit of clergy could only be claimed once. If he murdered again, the scar on his hand would betray the previous offence. No record survives of proceedings after Oxley was placed in the custody of the Bishop of Rochester, but the sentence must have been a light one as there is evidence he had been released by July 1612. He disappears from the Tonbridge records a few years later. The Oxleys were of yeomen stock, a prominent family involved for several generations in the cloth trade in Tonbridge. Edward's father had served as one of the Town Wardens, responsible for maintaining the bridges and paving part of the High Street. The Playhouse affair was not their first brush with the law. In 1576 one of Edward's uncles had appeared at Maidstone Assizes over his involvement in a fatal affray in Gravesend. Of the others involved in the Playhouse attack, one, the Tonbridge butcher John Holmden, seems to have been the ringleader. He was a 'known brawler' who had already appeared several times at assize courts and quarter sessions. Of the murder victim, Edward Calverley, little is known beyond the fact that he was also a yeoman and that his name appears in the register of burials at Tonbridge parish church. Why an insignificant place like Tonbridge (population about 600) should possess a Playhouse at a time when only four others are known to have existed outside London is a difficult question, but Dr Gibson has found several strands of circumstantial evidence. From 1558 two powerful barons, the Lords Hunsdon, had substantial holdings in the Tonbridge area, including the Castle and the manors of Tonbridge and Hadlow*. (Henry Carey, 1st Lord Hunsdon, was a cousin of Queen Elizabeth, his mother being Mary Boleyn, 'The other Boleyn girl'). The Hunsdons were keen supporters of Elizabethan drama over many years and sponsored several touring theatre companies, including the famous Lord Chamberlain's Men. Effigy on the tomb of Sir Anthony Denton in Tonbridge parish church. The murder victim was one of his servants. A further link with the Hunsdons comes through another important landowner with a country residence in the Tonbridge area, Sir Anthony Denton. His memorial in Tonbridge parish church describes him as one of the 'Honorable Band of Pensioners', an elite order of royal bodyguards into which he had been recruited by his fellow Tonbridge landowner, the 2nd Lord Hunsdon, who was its captain. Significantly, the victim of the Tonbridge Playhouse attack is described in the register of burials as 'Sir Anthony Denton's man'. The date of the Tonbridge affray may be significant also, since it coincides with the annual Midsummer Fair in the town – an occasion when a company of travelling players might well choose to visit. As to the precise location of Tonbridge's Jacobean playhouse, not a shred of evidence has yet come to light. *The holdings of the Lords Hunsdon also included the superbly-sited Great Bounds, on the west side of the road between Tonbridge and Southborough. 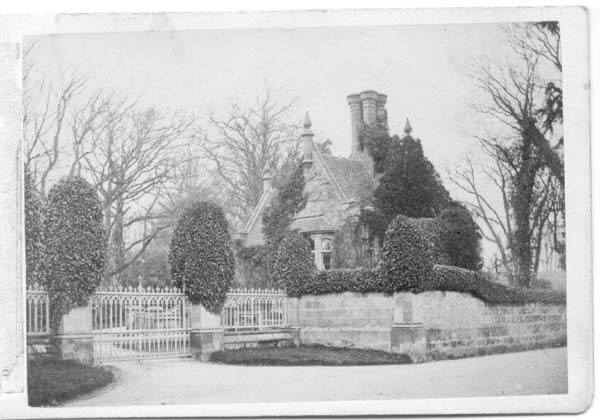 The house shown in this print may have been built by the 2nd Lord Hunsdon, but has been demolished. The 19th-century Great Bounds lodge remains alongside the A26 (picture).